Only one audio output port, but you can use 3 different types of audio cables for Chromecast Audio. Chromecast Audio, like Chromecast, is very simple in design and use. There are only two ports: one micro USB port for power adapter. The other port in the opposite side is for audio cables. So, there is no reason to insert the audio cables for Chromecast Audio in wrong port. 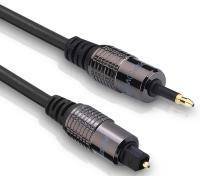 3.5-mm-stereo-to-RCA cable for analog output. This audio cable is NOT included. Mini TOSLINK-to-TOSLINK optical cable for digital output. This optical audio cable is NOT included. Although you can use 3 different audio cables for Chromecast Audio, you cannot use them simultaneously because there is only one port. Even if you use audio jack splitter, the audio output format is determined by the audio cable inserted into the output port. What are the differences of the 3 compatible audio cables for Chromecast Audio? The 3 types of compatible audio cables fro Chromecast Audio are designed for different usages. You need match it with your speaker or AV receiver. If your speaker or AV receiver accepts more than one type of the 3 audio cables, you may want to understand the differences so that you can get the best audio quality. Or if you are planning to buy a new speaker or AV system for your Chromecast Audio, you may want to check the possible inputs for the speaker or AV system. Most speakers, including most Bluetooth speakers, has an input port for 3.5-mm stereo cable. And Google includes this yellow (lemonade) cable in the box already. So, this is the simplest and cheapest solution if you speaker or sound system supports it. 3.5-mm stereo cable is for analog audio output. This means if you plug in a 3.5-mm stereo cable, the DAC (Digital-to-analog converter) in Chromecast Audio will convert digital audio signal into analog audio signal automatically. If your sound system supports digital input and has a high-end DAC, you may want to use digital TOSLINK optical cable to benefit from the possibly better DAC. Please note, Chromecast Audio, although cheap, has a decent DAC. The DAC in Chromecast is a AKM AK4430 192kHz 24-bit stereo DAC according to iFixit’s teardown. The sound quality should be comparable to most AV receivers with a price tag about $200-$500. 3.5-mm stereo cable can only carry unbalanced audio signal for stereo audio, and therefore it is susceptible to electromagnetic interference. This is the reason why the cable should be as short as possible. Technically, 3.5-mm stereo cable uses the TRS (tip-ring-sleeve) connector. If your speaker or AV receiver does have RCA jacks, you need get a 3.5-mm stereo to RCA cable, which should be quite cheap. RCA cable and jacks are based on very old standards of Radio Corporation of America. Two separate cables transmit two mono audio signals individually. So, Chromecast Audio treats 3.5-mm-stereo-to-RCA cable as a normal 3.5-mm stereo cable. You probably can find such this 3.5-mm-stereo-to-RCA cable for your Chromecast Audio in the garage. If not, you can easily get it at a few bucks from most hardware shops. TOSLINK (Toshiba Link) is is a standardized optical fiber connection system for digital audios. Compared to analog audio signals through stereo cables, there is no interference for digital audio. This is the reason why most HiFi systems prefer digital input (or coaxial). The digital audio signal is processed by your speaker or AV receiver. It is converted to analog output eventually with their own DACs. So, technically Mini TOSLINK to TOSLINK optical audio cables for Chromecast Audio can only avoid signal interference. 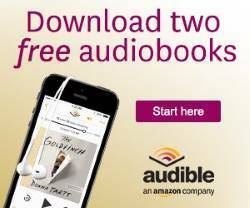 There is no guarantee a better audio quality. But generally speaking, most sound systems or speakers with digital input usually have decent DACs inside. And they usually optimize and fine tune the speaker (and firmware) for that specific DAC chip. This is the reason why the audio quality usually is very good on such systems. The optical audio cable is NOT included in your Chromecast Audio box. You can get a 6-feet one at about $10 . What’s the audio quality of Chromecast Audio output? Why audio cables for Chromecast Audio matter? Chromecast Audio, although with decent output audio quality, is not a high-end HiFi device. The $35 price tag is the reality. But Chromecast Audio is seldom the bottleneck for audio quality in your sound system. The audio quality is always limited by the worst one. For example, if you have a densely-compressed and distorted audio source file, there is no way to get decent audio quality no matter what audio system you have. DAC if you use analog output (i.e., using 3.5-mm stereo cable or 3.5-mm-to-RCA cable). As mentioned in several pages, the DAC in Chromecast Audio is a decent one. It seldom is the bottleneck for a speaker or AV receiver with only analog input. signal interference and distortion if using 3.5-mm stereo cable or 3.5-mm-to-RCA audio cables fro Chromecast Audio. Because both of these two cables handle only unbalanced analog audio, it is impossible to shield all interference. But if the cable is short and the connector is in good condition, this again seldom is a problem. Don’t complain the length of the 3.5-mm cable in your Chromecast Audio box. The shorter, the better, for audio quality. media source quality. This actually is not controlled by Chromecast Audio. It depends on content providers. The dual band with 802.11 AC WiFi connection in Chromecast Audio is an overkill even for streaming lossless audios. 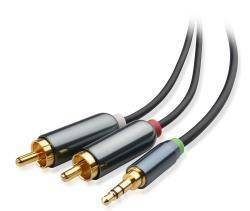 if your speaker or AV receiver supports digital input, try to use TOSLINK optical audio cables for Chromecast Audio. if possible, use short audio cables for analog output. The shorter, the better. if you have the choice, choose high quality streaming source. If you stream local music files, try to get lossless files, e.g., FLAC. within your budget, try to get quality speakers or sound systems. You should try to avoid the cheap Bluetooth speakers (with analog input) sold in many handphone shops. These speakers are designed for “Bluetooth” quality. Of course, there are many decent speakers with Bluetooth connectivity. This is a totally different story. And most important, trust your ears, not the price tag. Cheap solutions can be good enough for you. Are you using the correct audio cables for Chromecast Audio? Do you know how to get the best audio quality for Chromecast Audio? If you have any questions or encounter any problems on the 3 compatible audio cables for Chromecast Audio, and audio quality for Chromecast Audio, please let us know in the comment box below. Hello I have question for you, toslink should be lit in red at the end cable when you connect it to CCA right? and I think it should in order for it to transmitted the signal to my Receiver, the reason why is that my CD player did showed that red beam at the end of that optical cable,that being said I think my CCA is not working no audio out at all ,we’ll it time to return it. Did you get audio if you use the bundled 3.5mm stereo cable in the Chromecast audio? Did you finish the initial setup? Thank you for your quick reply,yes all set up has been set and ready to cast,my Hifi system does support Digital input and output, and also has DAC build in as well,it’s work just fine with my Bluetooth with build in Aptx, with Coaxial output to my Preamp input, the sound is good but not excellent because the bandwith is bottleneck and lack of details compared to CD. Spotify to cast as well as Google play nothing happened the sound coming from my tablet but not my Hifi system,don’t you think it’s could be a false unit? The only thing I think that, that Toslink RED Beam should be on when connected from CCA. I still have problems to figure out your HiFi system configuration. To test Chromecast audio, just use any speaker with 3.5mm input and connect Chromecast audio directly to it. In Google play music, or Spotify, after tapping the casting icon and select the Chromecast audio device, the music output from the app should not go to tablet at all. If Chromecast audio is not working, you will not hear the music. It will not fail over to tablet until you stop casting. Also, when you setup Chromecast, it should ask you whether you hear the sound from the speaker. No, Chromecast doesn’t have a coax output. I know your question was posted at the beginning of the year, so you may have found a solution already. I just read this helpful article today after receiving the device as a birthday gift yesterday. While the Chromecast Audio output does not allow for digital coax, there are mini Toslink to digital coax cables available for purchase from a variety of manufacturers and vendors. I believe one of those would suit you and your application. Thank you for your suggestions. By rearranging my inputs on my receiver, I was able to free up a position so that I could use the 3.5 m/m to two RCA connectors cable. I connected the CCA via Toslink with my DAC. Sounds pretty good. But not as detailed and “roomy” (excuse; l’m Dutch) as my CD player. Could it get better if I use the coax entry of the DAC (by using a Toslink/Coax transmitter for €20,-)? The quality is also determined out limited by the music source. Most streaming service providers offer compressed music only. In your case, the cable probably is not so important. I’m currently looking for the best quality/price relation product to connect wirelessly my active speakers (Swans M200MKII) with my PC and play .mp3 and .flac music stored on my drive. Is it possible with Chromecast Audio? I never try the AirTry. So, I cannot comment on it. For Chromecast Audio, it is NOT a wireless audio transmitter. It is a streaming device. Its main usage is for internet streaming. But, you can play (stream) local music to it as well. If you have a sizable collection, you can use Plex media server on the PC. Of course, for FLAC and other loseless music files, direct connection to PC (if your PC has digital audio output or has a good sound card), usually gives better quality than any wireless solutions. Nope, unfortunately I don’t have a digital audio output and my sound card is a regular notebook on-board one. So what type of devices we have out there? What’s the difference between streaming devices and audio transmitters? And finally, back to my first question – if my aim is to only stream music from the PC (I’m not using Spotify or Google Music) is Chromecast Audio a good choice? Or maybe you know some better alternatives? Thanks in advance! Yes, you can play music from the PC to the speaker through Chromecast audio. The music quality should be far better than Bluetooth. Please note, Chromecast audio requires internet connection even you play music locally. Chromecast android must connect to the same router as the PC. It doesn’t use internet bandwidth, but it requires active internet connection. Wireless transmitter is usually expensive and there is no standard. Chromecast audio is far cheaper. I’d like to connect CCA to the binding posts on the wall plate in my house. The binding posts accept bare speaker wire. What adapter do I need? Maybe Banana plug to RCA adaptor can do the job. I never tried this and I cannot recommend a specific product. But there are a few in Amazon. I have an early 70s Sansui receiver. I bought a 3.5mm to RCA cable to plug into the AUX port of the receiver. I am hearing a very loud buzz sound through my mid 80s Klipsch loudspeakers. The receiver and the CCA usb-power supply are plugged into the same power bar. I read somewhere to plug the CCA into a wall outlet and not a power bar (which I did), however this did not work. Any other suggestions to remove this annoying buzz? Is there a way to upgrade the power source of the Chromecast? Thanks. Did you hear the buzz sound without casting anything? If yes, it’s very likely due to the cables/connectors, not Chromecast audio. Did you test it with other devices (e.g., mobile phone) for the same cable and port on the receiver? You can insert power adapter into any socket as long as the voltage is correct. Just don’t insert the USB cable to your receiver or PC (without using the adapter). What did you think, speaking on audio quality in a Chromecast HDMI vs Chromecast Audio (with TOSLINK) connected to a new generation Sony receiver? Chromecast and Chromecast Audio are designed for different applications. You need to know what you want. For audio quality, it depends on the original quality, internet bandwidth, and DAC. If you use Toslink to the receiver, the DAC in the Sony receiver will be used. Hi, question here. I have the following setup: Marantz 1060 receiver (RCA input) with a Beogram 100 record player, vintage Marantz CD player and my PS3 connected to it (PS3: component). I get great sound out of all those sources. But most of the time I listen to music through Spotify. I have an iPad connected through 3.5 mm to RCA. But the thing is, volume is very low and all in all it doesn’t sound nearly as good as the other sources, even compared to playing Spotify music from my PS3. The difference is huge. What I’m wondering is, if instead of connecting the iPad directly to my receiver via 3.5 to RCA, I put a Chromecast Audio in between, will that improve the sound quality? It’s still 3.5 to RCA, but will the Chromecast Audio’s DAC do some miracle work here? The quality of streaming depends on not only your device, but also the original music source and internet connection speed. For your case, when you play Spotify music through iPad, the sound quality can be limited by the tablet which usually is not so good for music. But it can also be caused by the connection or even the source file. Anyway, when you play Spotify through Chromecast/Chromecast audio, the DAC in Chromecast Audio should give better audio quality than that in iPad (you still need iPad or other mobile devices to initiate the casting, but after that, Chromecast audio will connect directly to Spotify. Mobile devices are used as remote control). The music quality should be comparable to what you get with PS3. Thanks! I should be finding that out today, as my CCA can come in any moment now. Had some set up issues, but it’s working flawlessly now. Output indeed comparable to PS3. I’m a happy camper. Thanks! Still having connection issues though. After the initial issues it worked fine the whole evening yesterday. But this morning my phone wouldn’t connect and now it doesn’t even show the cca as an available device. Tried going through the set up again, but it also won’t show up in my available wifi networks. Can you check router settings to confirm whether there device is connected took the router? Also, what’s the colour of the LED in Chromecast device? Please note, you should use the included power adapter. Don’t connect the USB cable to any other USB devices. The LED is pulsing white and it doesn’t show up under devices in my router settings. This is weird cause for the past two days I connected the CCA to my wifi in the morning, been using it throughout the evening after work without any problems, go to bed and in the mornig it’s disconnected. I do use the included power adapter. I have a regular chromecast as well, no issues with that so far. What’s different with CCA? Another fact: in order to reconnect my CCA in the morning, I need to change the name of my wifi network, otherwise it just won’t connect. On Chromebook it does find the temporary CCA network, but won’t complete the setup and on iPhone the temporary CCA network won’t even show up without changing the name of my wifi network. Pulsing white LED indicates Chromecast Audio cannot connect to the router. Chromecast and Chromecast Audio have identical network adapter. So, normally if Chromecast Audio should have no issues if Chromecast can connect to the router. If this happens again, you can try to unplug the USB cable for Chromecast audio, wait a few mins, then try again. Anyway, after changing SSID name, you need reset Chromecast audio and Chromecast (hold the only button), then set them up as new devices. During setup, Chromecast and Chromecast audio will act as a temp router temporally for your devices that are used for setup so that you can save your SSID and password to the devices. Hi: I face issue when using chromecast audio witth optical link to my dac: pop, crackes sounds when using audio sample rate over 44kHz… Did you ever experienced such issue when listening high res audio? Not sure. Do you have the same issue when using 3.5mm cable? Hi. I have a tv on my outdoor deck. The tv is connected to a small amplifier via a 3.5 stereo cable and the amplifier is then connected to the outdoor speakers via stereo wife. My question is this: Can I use a 3.5 stereo splitter to connect a chromecast audio, and, if so, would I then be able to control the amplifier with my phone? You can only control Chromecast audio with your phone, not the amplifier. Most stereo splitters are for two or more output devices/speakers/headphones (and one input). Chromecast Audio is an input device. If you want to use the splitter for TV and Chromecast audio, then connect to amplifier, I guess, it probably will NOT work. You should connect Chromecast audio to the amplifier or speaker directly. The CCA toslink signal is compatibile with an optical input of an HiFi amp? I mean, if I’m streaming from Google music, is the compresed signal convrted to PCM? yes, it is two-channel PCM audio, as I know. Hi. I’m curious about how volume control works with the Chromecast Audio. I have connected one, using audio cable, to my Hi-Fi amp and ‘send’ music to it from my mobile using an app called BubbleUPnP. This works great and I can control the volume using a slider in the app and using the volume up/down rocker on the side of my phone. However, I’m wondering how this actually works. The music I play is obviously digital (flac or mp3) and is transmitted as such to the Chromecast, via the router. Then the Chromecast DAC converts it to analogue. So where does the volume control come in? Is there a little pre-amp in the Chromecast that is used to control the volume? Otherwise, how? Thanks. Chromecast Audio allows the casting app to adjust the volume and respects it. When castings, not only the music source, but also some play parameters including volume settings are also passed to Chromecast Audio. During casting, you can also adjust volume at any time. Chromecast Audio will play a sound to acknowledge the change. Volume settings (percentage) are applied on Chromecast Audio. It has nothing to do with volume in your mobile device. Casting apps set the range from 0 to 100%. Then pass this info to Chromecast Audio, which will then adjust it’s output. The audio hardware in your phone is NOT involved. Anyway, you can always adjust the volume from the connected speaker to control the output of the speaker. Thanks for the quick reply. When you say the app passes the info to the Chromecast, which then “adjusts its output” this is at the heart of my question. Can a DAC adjust its output? if so, then thats the answer, but I thought a DAC couldn’t do that. If I bought a seperate DAC I would assume that it would output analogue info at a certain fixed level, leaving subsequent equipment to do the amplification and adjustment. Let me ask this in another way. Say I connect the Chromecast to an amp using an optical cable, so that it feeds a DAC built into the amp. Then the connection is digital all the way in and out of the chromecast. Would the app playing the music still be able to control the volume? I think not. So I’m thinking that the Chromecast must have some sort of pre-amp circuit to allow for volume adjustment. Its just that im curious about this sort of thing. Thanks again. Chromecast Audio is not just a DAC. It is a complete media player (without speaker). Yes, it can adjust the output volume (analogue). For digital output, technically, volume can still be transmitted through digital signal. But it is not desirable. So, the common practice in the industry is to omit the volume and let the receiving device decode the digital information and use its amplifier to produce the analogue output. Hello. I’m a bit curious about this aswell. So that you only adjust the volume in one place? It can. I do control the volume via the IPad and my CC is plugged in a DAC. By the way: in between is a Monarchy DIP (jitterkiller). Sounds great all together. Thanks. I thought that was the case. So if I buy a separate, high quality, DAC and connect the Chromecast to it using an optical lead, then this will bypass the internal amp circuitry of the Chromecast, meaning better sound, yes? But then the volume could not be controlled from the sending app, yes? Yes, for digital signal, almost all receiving device will ignore volume info if any. Chromecast Audio has a decent DAC by the way, although it is cheap. Thanks Simon. My questions have been answered. I’ve compared flac files sent from my mobile, using Chromecast Audio, with the original CD and using headphones. I’m surprised at how well the Chromecase performs. My main reason for deciding on the Chromecast is to give me remote volume control. My rather old Audiolab amp doesn’t have remote control and I’ve been finding it a nuisance to be constantly walking back and forward to turn it up or down. i wish to connect chrome cast audio to my arcam dac via a optical out, and then further to my stereo marantz reciever 8005 amp to a monitor audio RS8 setup. would this effect quality over my direct wired setup with my arcam dac via a computer. i play hi-res flac files. For arcam dac, Chromecast Audio and PC are just different inputs. They should not affect each other. Another option for me is to connect a chromecast media to my Arcam DAC via its HDMI out to my DACs usb input. Further connecting my DACs output to my hifi audio setup. would chromecast media serve as a data transfer to my DAC, I can get an advantage of using DACs superior interface to produce best possible sound quality. No, Chromecast will not relay your data. It’s HDMI output is normal HDMI output. It depends on downstream device to handle the HDMI signal. Hello..i am having a Yamaha Network Receiver RN 402 which is awesome..can you please let me know can i stream music via google chromecast audio device? Also my receiver has a digital output. You can connect Chromecast Audio to the receiver through line-in input (3.5mm to RCA cable), or optical input (Mini TOSLINK to TOSLINK cable). I don’t think your receiver have a digital output (most receivers should only have optical input, not output). What a great page! Thanks a lot. Will bookmark. Hi…I have a very basic question. Can we use mini toslink cable to connect to optical out of Chromecast audio to get a 5.1 or possibly a 7.2 output for a home theatre setup? It is actually a hard question because the answer depends on many factors. Chromecast Audio itself supports 5.1 or 7.1. But the Mini-TOSLINK to TOSLINK cable only supports compressed 5.1/7.1 streams. For uncompressed streams, it only supports 2 PCM channels. Most apps, that offers 5.1 or 7.1 sound, may not work well with Chromecast Audio. In this case, Chromecast Ultra (or the new Chroemcast, not the 1st gen Chromecast) actually works better. The HDMI connection does not have the bandwidth limitations. They support 5.1 or 7.1 sound from most apps. Hi Simon – great page. Can you tell me if the CCA Toslink limits output to a maximum of 48khz? I have some high resolution source material (96khz and upwards) but when I google cast it from my phone, the display on my amp indicates that CCA is downsampling it to 48khz. For higher quality, would I therefore be better off using CCA’s analog out connection or is this also likely to downsample? Thanks. The Toslink is probably not the cause of the problem. Very likely, it’s caused by the phone/ player. If the phone hardware doesn’t support 24bit/96kHz music, all music will be played 16bit only. Which phone are you using? Hi Simon. It’s a OnePlus One which, as far as I know, supports up to 24bit/96kHz music. Also, I am using the latest USB Audio Player Pro (UAPP) with MQA support. This displays a 24bit/96kHz audio stream on the phone screen as it plays; it is only when it has gone through the CCA that it appears on my amp as 48kHz. I heard about that player. But I never tried it. Does the player support Chromecast? (how dod you cast?) If not, you are using screen mirroring, which will limit the audio quality. To stream my music, I have the option of using my CCA with optical output, or using the built in AirPlay2 streaming in my receiver. Since my receiver does all the DAC, is there an advantage to either one of these wireless connection when it comes to the best audio quality? Both are good. For AirPlay, it also depends on the implementation of the hardware. I purchased a CCA through an eBay seller just before Christmas and was impressed by the sound quality..However a fault quickly developed with the supplied yellow 3.5mm cable and after losing one channel is now not working at all.I have tested another cable of a similar length but there seems to be a subtle loss of sound quality and level as the yellow cable level was specifically designed of course to work with the CCA. The seller has been unable yet to find a genuine replacement so can you help with this please as the supplied cable should not have failed so soon after purchase? The3.5mm cable is generic. Any decent 3.5mm cable should work. The length (less than a few meters) does not matter. The quality of the cable matters.